5 Questions with long-term resident Stan Searfus, Coronado Middle School and High School surf coach and founder of Blue Wave Coronado. 1. What brought your family to Coronado? My parents met in Coronado in 1950. My father was a Navy pilot and my mother was visiting from Indiana. Three weeks after they met, they were married. In 1967, when I was six, my father was killed in action during the Vietnam War. My mother made Coronado a permanent home for my five siblings and me after his death. 2. You began surfing at age 12. Do you remember your first wave? My first legitimate wave was at Central Beach. I remember it well because I had the opportunity to use my friend’s board – much nicer than mine and lighter in weight, which helped me catch the wave. My brain thought “turn” and the board moved with me, right where I wanted to go. It was magic. I remember feeling unrestricted, with nothing else in the world on my mind. I still feel that way when I surf now. By age 15 I was making ocean rescues. Sailors would get caught in a rip tide, and I would help them get out. In 1983 I became a lifeguard at NAS North Island. In 2011, management changed and I was let go. 3. The same year you left lifeguarding, you started a summer surf camp called “Blue Wave Coronado” through the city of Coronado’s recreation department. What motivated you to do so? I decided to start Blue Wave Coronado because my brother and I have been giving surfing lessons on and off since we were young. The camp is great because we have a balance of local kids and tourists and I get to see new friendships develop. A lot of the kids come back every year, so I witness their progress. The camp is open to students ages 6 to 18. We meet at the beach in front of the Coronado Shores and each session lasts one week. During the week, the kids not only learn to surf, they also learn about marine biology and the importance of ocean safety. 4. You oversee the Coronado Middle School and Coronado High School surf teams. What are some of their accomplishments thus far? Watching our students go from novice to competitive is a very exciting feeling for me. The competition between the students is all in good fun, but I also encourage the kids to start competing in contests if they are interested. This year, our Coronado High School team competed in Division 3 against seven other teams in San Diego County. The season itself consisted of five contests, all of which we won. In April, our Islanders competed in the California State Championship and the girls longboard team took first place. Those girls succeeded over other well known high school teams such as those in Malibu and San Clemente. I am extremely proud of them. 5. What makes Coronado a worthy location to learn to catch a wave? You can surf year round here. There are also plenty of waves to choose from, as the beach stretches from North Island Naval Base down to Gator Beach at the Naval Amphibious Base. The ocean bottom is sand, so if you fall off your board, you won’t hurt yourself on coral or rocks. Yet another benefit about Coronado beaches is that the waves never seem to get too crowded to surf at. Some locations, like Encinitas, can get so overly crowded that there is no room to learn. Lucky us. 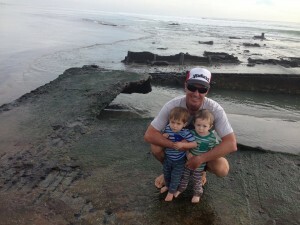 Stan Searfus pictured with sons (L-R) Jake and Josh atop the SS Monte Carlo shipwreck earlier this year.